Marguerite (Turenne) Bersani, 97, born 7-11-1921 in Thorough, Ontario, Canada and lived all her life in Syracuse, NY. She was predeceased by her beloved husband, Gabriel, her son, Lewis Bersani, her parents, Alice and James Turenne and her sister, Evelyn Delegato. Marge and Gabe owned and operated Bersani’s Shore Inn on Oneida Lake for 40 years. 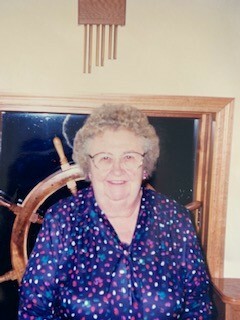 Marguerite was always active civically working the voting polls, was an honorary member of the Daughter’s of Columbus and a lifetime member of the South Bay Fire Dept. Women’s Auxiliary. She is survived by two daughters, Peggy Bersani Stevens (Paul) and Gabrielle “Gail” Bersani Stevens (Tom) and daughter in law, Ann Bersani; her grandchildren, Jim (Jane) Bersani, John (Lisa) Bersani, Lori (Barry) Bersani, Raina Dean Heinley (Aaron Hurley) and Lewanna Bersani (Ryan Mayer); great grandchildren, David Rossi, Daniel Heinley, Lukus, Rhyli, Blair, Ryan, Kara and Kristin; and great-great grandchildren.